Following is a cnc program exmaple code for cnc milling machine. 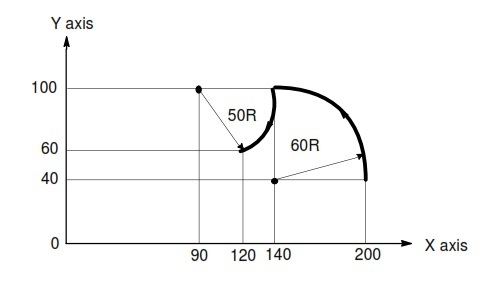 This cnc example code illustrates the usage of CNC Absolute Programming G90 G-Code and Incremental Programming G91 G-Code, as well as the usage of Circular Interpolation G-Code (G02/G03). This cnc program draws (machines) cnc mill Arc with R as well as Arc with I.